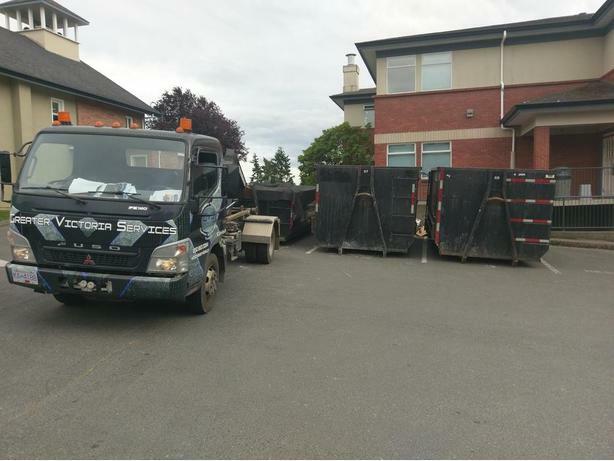 Greater Victoria Services has a full fleet of bins ranging in size from 6-40 yards offered at very affordable rates. We are pride ourselves in offering some of the best service in the industry while maintaining one of the lowest cost. We come when we say we do!!! Our mini bins come in 6, 13 and 20 yards in size and are delivered with a very maneuverable cab over truck. We can get your bin where the big trucks can't without suffering capacity. Chances are if you can get your pick up truck there we can get our bins there. Our full size bins are available in 30 and 40 yards in size delivery on a tandem axle truck which is only 26ft long with a payload capacity of up to 15 tons. This is up to 10ft shorter and 50% more weight then the competition. Our tandem also has the ability to pick up our mini bins meaning if you overload the bin we have the option of picking up the bin with the bigger truck instead of making you unload the contents. This comes in especially handy when dealing with roofing, fill, and drywall. Mini bins are only $140+dump fees and taxes. Full size bins are only $250+ dump fees and taxes. Are you a contractor? We can tailor a bin a solution to your needs to maximise your profit or minimise the cost to your customer.